I have recently purchased 2 English Spots, and a buck for meat rabbits. I'm so excited to be starting in this venture, and the learning it entails!! Your site has been one of the most helpful I have found, so thought I'd share a couple pictures of my mini-rabbitry with you. Thanks so much for all the information you provide! Is there any way you can tell me what kind of Buck I have? As a beginner, I'm not proficient in that yet, and feel like I have the answer at times, but not quite. 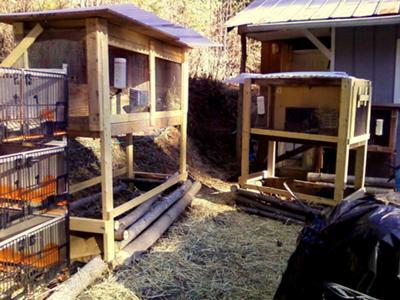 I'm adding more hutches, and have a fryer holding pen, for just prior to butchering. A work in progress! I am pleased to say, that things with my livestock continue to thrive. I have had a few minor issues (ear mites, and one sore hock case). I'm on rotation 4 now, as far as new kits. 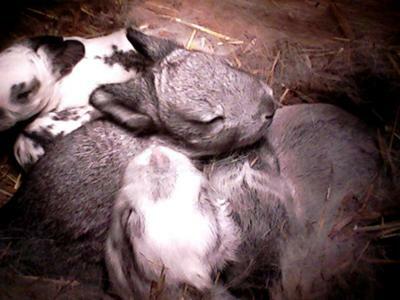 I kept one female and one male from the very first litter, as they have a velvet pelt. Velvet is really the only way to describe it, very similar to a Rex pelt. I'm on a continual quest to try and have mostly this pelt type, as it makes really amazing blankets, clothing, etc. I have one true black male, that I've also kept, who has the above mentioned pelt. He's truly a wonderful looking rabbit! I am really thrilled to be taking responsibility for what meat I put into my body. This will be a continuing journey for me, and one I think will make myself and my family, healthier and more aware human beings. I ate meat for years, without thinking of it's origin. Health is so important, but to ME, humane rearing and butchering are at the top with health. I am very mindful of the cleanliness of my rabbitry, as well as caring and humane treatment. I ask for all my livestock to go in peace, and thank each and every animal for it's contribution to my family, friends, and other families who purchase them to enhance their own lives. Butchering is not something I enjoy doing, but I do gain a great sense of peace, knowing that my stock is treated with respect. Judaism, Muslim..these are religions who will not eat an animal that has suffered. I do not judge those who are unwilling to do what I do. As such, I would hope there would be no judgment about my attempts to live in the life cycle with nature, on a humane, harmonic, and responsible level. Alas, realistically, there will always be those that do. Thanks again for the site, and it's wonderful resources! From your pictures I see you are a responsible rabbitry owner! Although I love rabbit stew, I can't seem to go that far yet! My bunnies are for pets right now, but I have looked into meat rabbits during my search for information! I think it is wonderful that you are using all of the rabbit and not just fur or meat! I have heard that rabbit it quite lean and great protein for dogs! I look forward to seeing more about your rabbitry. P.S. To the Mar 13th Anonymous post.....you obviously have a skewed opinion about raising animals for food however each is entitled to their opinion so I leave you with this! I pray you will never find yourself stranded or starving with only rabbits for food for surely you would perish because you did not seek to have all the information before passing judgement! I find it revolting that you can be so excited about a litter of rabbits that you will raise just to be slaughtered and sold to dog and cat owners from all over! What people will do for money these days! Thanks for the positive feedback, Karen! My buck is 7 months old. I don't know his weight right at the moment, but he's a pretty hefty lad. He is completely blue, with the exception of one thin strip of apricot, on his rump. The kits that he produced, are blue..with some having the English Spot coloration (the Mum) to a tee. I have one little guy that has the black spots, and one the blue. I also have a BLACK kit. She is completely different than the rest in coloring. A couple of them have a longer fur type to them, like their Pop. I'm also going to be tanning the hides (I'm really big on utilizing the animal in its entirety), and will be feeding my pups what I cannot use. I'm very excited to be at the beginning process of a raw diet for them. YES! Worms are a part of my compost! Wow! What a great start to your meat rabbit enterprise! 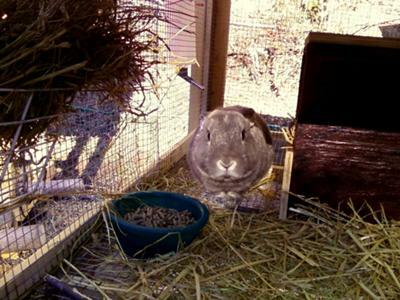 Your bunnies look very healthy and well-cared-for by the doe. 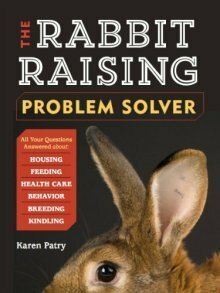 We're gratified that you've found Raising-Rabbits.com to be very helpful.Thank you very much for sharing with us. Lastly, wanted to compliment you on the manure bins. 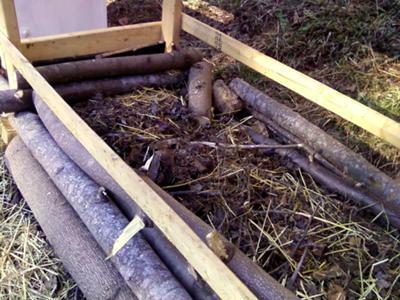 It looks like you may be able to pull away the saplings for easy manure removal? If so...ingenious! Are you thinking about growing and selling worms as well?